William Kermitt Karr was born on February 2, 1922. His mom was Bertie Karr, and his dad was William Karr. He had two brothers and two sisters (Jackson K. Karr, Robert D. Karr, Lucille D. Karr, & Lillian L. Karr). He was the eldest. He graduated in the class of 1940 at Corbin High School, and worked as a carpenter helper, with his father. William was 18 or 19 when he enlisted in the Army Air Corps. 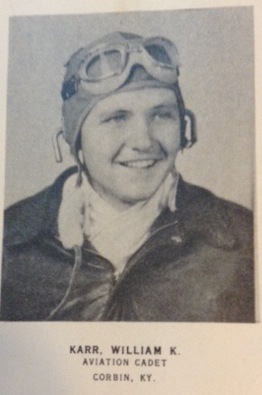 He eventually became a 2nd lieutenant and Copilot in a B-17 Flying Fortress. His serial number was: 44-8377. On October 22, 1944 he died when his plane crashed somewhere near iceland. Now he is memorialized on the Tablets of the Missing at East Coast Memorial, New York City, New York. I would like to thank Doug Wilson for being so generous with materials and details.